In the debate over what should happen to Terri Schiavo, many lose sight of the facts and background of Terri’s medical history. Terri Schiavo had bulimia which produced a potassium imbalance which in turn caused a cardiac arrest. This shut-off blood flow to her brain, much of which then died. Today her cranium is largely filled with spinal fluid, not brain matter. Terri Schiavo: Victim of Bulimia or Physical Abuse? On February 25, 1990, Terri suffered a cardiac arrest due to a potassium imbalance. Just 27 at the time, she has never regained consciousness. Terri Schiavo’s potassium imbalance was brought on by a life-long struggle with her weight. She was chubby and shy as a child. It wasn’t until she lost 65 pounds that men began to pay closer attention to her, including her future husband Michael Schiavo. Keeping the weight off proved difficult, however, and Terri resorted to drastic measures. She developed bulimia and made herself throw up after meals. She tried to survive on liquids. It is ironic that a woman whose brain has died because of her efforts to avoid eating would become the center of a controversy over whether a feeding tube should be maintained in order to keep her body alive. It’s also sad because her bulimia is rarely mentioned in the news. Terri Schiavo’s condition could serve as a lesson to those whose obsession with food and body image lead them into eating disorders. 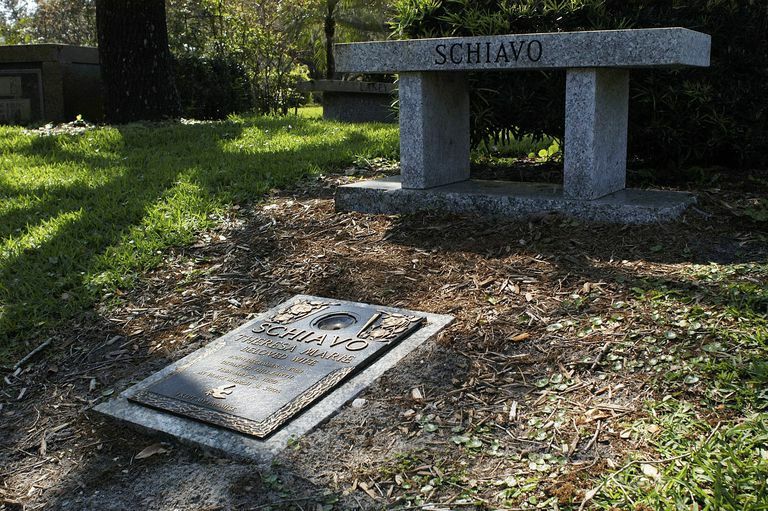 Terri Schiavo’s parents deny that she had an eating disorder and believe that Michael Schiavo had something to do with her condition. A 1991 bone scan indicates traumatic injuries to ribs, joints, her knees, her ankles, several vertebrae, and to her right thigh. Some claim that this physical trauma caused Terri Schiavo’s condition and, therefore, Michael Schiavo’s desire to remove the feeding tube is because he’s afraid she will recover and testify against him. Courts have not found these claims to be credible, nor have they believed that Michael is a callous husband. Michael Schiavo initially refused to accept her condition — when she was originally brought to the hospital, she might have been simply labeled DOA because of her time without oxygen, but Michael was adamant that they try to save her. All of the trauma to Terri’s bones is consistent with her cardiac arrest, fall, subsequent CPR, and resuscitation. There is also undeniable evidence of her eating disorder. This evidence was sufficient for Michael to receive a USD $1 million settlement on a medical malpractice claim. A jury agreed with Michael that Terri’s doctors failed to diagnose her bulimia. Had there been real evidence that her condition was the product of abuse, the lawyers would have played it for all it was worth. Where is Terri Schiavo’s Brain? One of the central issues in Terri Schiavo’s condition is the existence or absence of her brain, specifically her cerebral cortex. The cardiac arrest which Terri suffered halted the blood flow to her brain. This, in turn, killed brain cells and has led to the long term deterioration of her brain as her body reabsorbs dead tissue. A CT scan taken in 1996 revealed profound abnormalities. An EEG performed reveals that there is no electrical activity. In 2002, a CAT scan demonstrated massive atrophy. In place of normal brain tissue, almost all that is left are connective tissues and spinal fluid. Aside from a brain stem that keeps some autonomic functions going, she simply doesn’t have a brain. All of the doctors hired by Michael Schiavo and all independent doctors hired by the courts have agreed: Terri Schiavo is in a Persistent Vegetative State. No other conclusion is possible given the absence of a cerebral cortex. Doctors hired by Terri’s parents have disputed this diagnosis, but not in a substantive way that the courts have been able to take seriously. These doctors do not explain why the tests done so far are wrong (i.e., that she does have a cerebral cortex) or, if the tests are correct, how a person can have consciousness and self-awareness in the absence of cerebral cortex. A persistent vegetative state means that a person’s brain is so severely damaged that even though they may exhibit wakefulness, they are incapable of experiencing awareness or reacting in a consistent manner to external stimuli. Terri Schiavo’s behavior may mimic normal consciousness and the heavily edited tapes released by Terri’s parents serve to perpetuate that impression, but tests performed by qualified physicians have demonstrated that there is simply nothing left there.